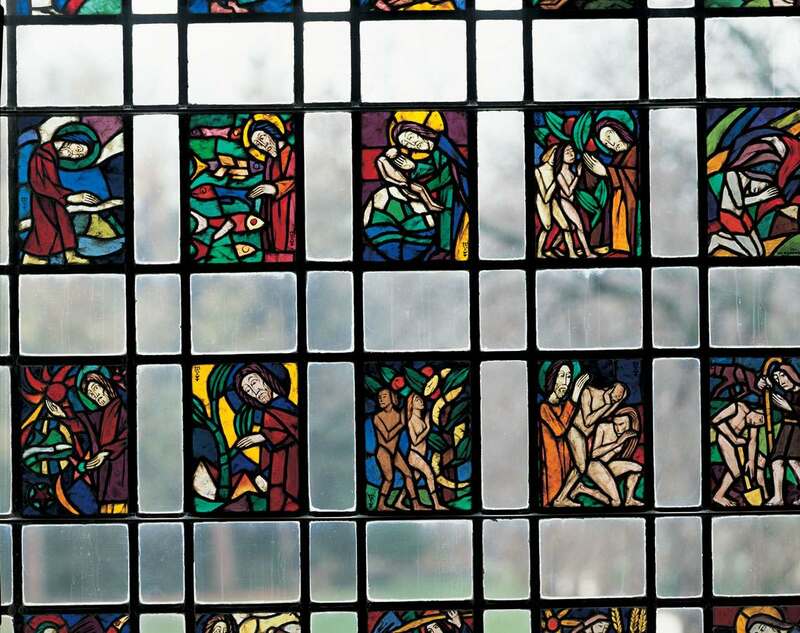 German artist Wilhelm Rupprecht tells the Biblical story of creation by merging medievalist conventions with modernist style in this stained glass work. In the panel of God admonishing Adam and Eve for eating from the tree of knowledge, for example, Rupprecht represents a larger God (to show his greater importance) towering over the modern figures of Adam and Eve, whose more closely observed bodies are modeled with paint. Designed in Munich in 1921 and installed in the Art Museum foyer in 1942, the twenty-four panels, placed in random order, are part of a larger series of twenty-seven panels depicting the story of Genesis. They capture the light in a rich palette of lapis lazuli blue, emerald green, turquoise, red and ochre. Well known for his religious devotion, George Booth must have felt the installation of this work sanctified the Art Museum as a temple for art.